WELCOME TO THE WATER: Sea-Doo Dave! Recently we came across this story about an avid fisherman who also is serving in the US Navy. While he was away on deployment some of his friends got together and retrofitted his Sea-Doo and turned it into the perfect bass fishing personal watercraft. We want to thank all of the friends, family and businesses that generously provided Dave with this awesome surprise and we would like to thank Dave for his dedication to the United States Navy. Enjoy your time on the water Dave! Here is the story as told by JetSkiBrian Lockwood, one of the masterminds behind this generous gift. Several months ago my brother John and I decided we wanted to do something special for Dave W.
Dave is a young enlisted Navy man that is stationed here in Norfolk Virginia. He was on a 7 month deployment that turned into 9 months aboard the USS McFaul. His ship returned to port on Sunday. While Stationed here Dave has shown a genuine enthusiasm for salt water fishing. He has participated in many seminars and local Angler Club meetings. Before he deployed Dave dropped his Sea-Doo off at Martin’s Custom Structures in Gloucester Va. to have some custom pipe work done. My brother John and I surprised him by taking care of the expense while Albert Martin also agreed to store Dave’s ski under cover while he was out to sea. I had told some friends and local businesses of my intentions to surprise Dave when he returned from deployment and they were all were eager to join in. Some of the items given to Dave; two nights at a Hampton Inn, personal EPIRB, two custom rods w/ Shimano reels,Diawa reel, several shirts and hats, custom embroidered back pack, many fishing lures, framed pictures of USS McFaul and more. These are the great people and businesses that donated items. Last Sunday as the McFaul finally pulled in to Norfolk Rob and I where there to great the ship and take several pictures. We all gathered last night at Yorktown beach, and with the help of Dave’s girlfriend Melanie, we were able to totally catch Dave off guard and surprise him with all these things. Thanks Dave for your service in the United States Navy! Next year, Dave isgoing to be stationed in Connecticut. For the next several weeks he will be in the Chesapeake Bay after Striped Bass on his PWC. 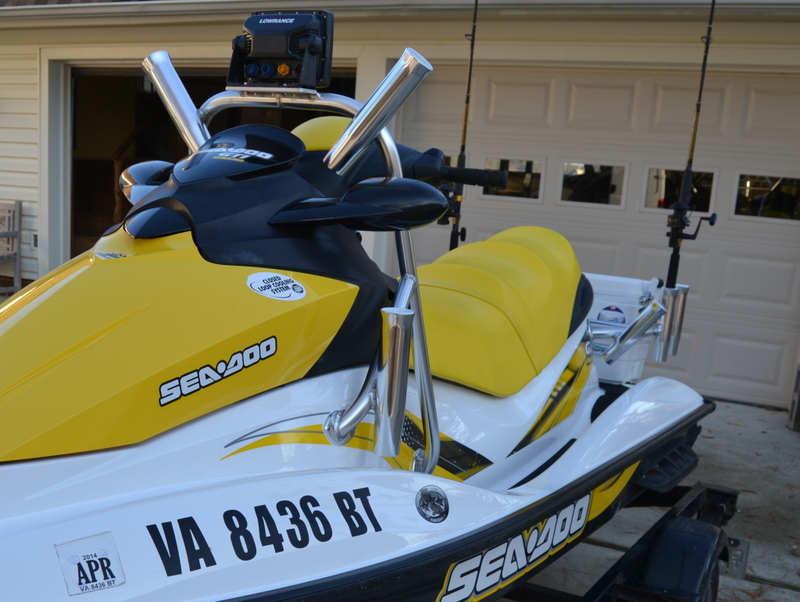 Here are a couple pictures of Dave’s newly rigged Sea- Doo.